On Saturday 13 septemeber 1952, Billie was a surprise guest on a JATP concert at the Carnegie Halli in NYC. Down Beat reports: "Biggest letdown of the night was a surprise guest Granz had saved especially for the New York crowd, Billie Holiday. 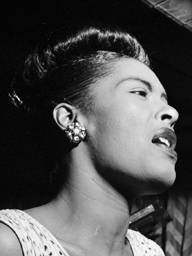 Down Beat reports: "Biggest letdown of the night was a surprise guest Granz had saved especially for the New York crowd, Billie Holiday. In her first appearance in New York in several years, Billie sang half-heartedly, nevously". Thanks to Michel Fontanes for fisrt issueing this track. 1 Lover man (oh, where can you be?) LR KBF 1323 KBF 1323 2'52"